Kitchen cabinets are one of the key focal points of any kitchen, regardless of its size. Older kitchen cabinets can make an entire kitchen look out of date or can make the kitchen look small due to poor color choice. When renovating a kitchen or replacing appliances, many homeowners wonder if they should have all of their cabinets replaced or if painting old cabinets can provide similar results. In fact, it is often much cheaper to paint your old cabinets than to have them replaced. In some cases, homeowners choose to throw away high-quality wood cabinets and replace them with cheaper cabinets as a way to modernize their home on a budget. However, keeping high-quality cabinets and repainting them will often be more impressive since a color change can make a big difference in how modern cabinets look. This is amplified further when the cabinet handles are changed to match the new color choice, which is an inexpensive way to totally transform the style of your kitchen. Before deciding to keep your current cabinets, make sure to analyze their current condition. Are the cabinet doors made of a material that can be sanded and repainted or are they made of chipboard and veneer? Chipboard cabinets are not likely to be worth painting since the thin plastic or wood veneer does not always allow for the sanding that is required to apply paint. If your cabinets are made of hardwood or have a surface that tolerates sanding, then painting is highly recommended and can be accomplished by using the correct paints and primers for the job. The next step is to make sure that the cabinets are not significantly damaged. Split, warped or dented wood needs to be repaired before painting, which can be difficult without the help of a professional. If damage to the wood is minor, wood fillers can help hide any blemishes before painting. If you are determined to keep the cabinets that you have, but aren’t sure which materials to use or if the cabinets can be repaired, it is an excellent idea to consult with a professional painting company who can help you plan your course of action or complete the job for you. Painting your cabinets once they are sanded requires both paint and primer. If you are painting a wood cabinet, then wood primer and wood paint are required. If you wish to stain your cabinets with a tinted wood stain, then no primer is necessary. Whenever working with wood, it is important to make sure that the wood is perfectly dry before painting, which can sometimes be difficult in humid and rainy climates. Any trapped moisture under the paint will cause bubbling and peeling over time, especially if the sun touches the cabinets and forces trapped moisture to escape. When working with plastics, special plastic primers are required for adhesion. Without these special primers, which may be more expensive, paint will peel away from plastic very quickly. 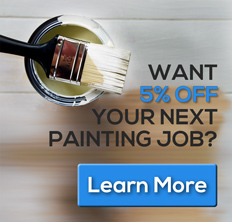 If the choice in materials is confusing and frustrating, it is often best to hire a professional painting company that is familiar with all the various products and their advantages. Lastly, you will also need paint brushes or rollers and plastic and tape to cover areas that are to remain free of paint. Once all the cabinets have been sanded and the materials have been selected, it is important to plan how each cabinet will be painted. For best results, it is necessary to remove the doors and hinges from all the cabinets, so that there aren’t any unpainted surfaces or rough tape lines when the paint job is complete. Next, you will need a table or paint rack to hold the cabinet doors while they are painted and primed since they are no longer attached to the cabinets. Professional painters have access to special racks and hooks to hang doors and cabinet panels while they are painted and primed, either with a roller or with spray guns. Of course, professionals can execute this type of paint job much faster and at a higher quality level than any homeowner, so it is important to consider if doing the work on your own is truly worth it or not when you consider the equipment and materials required, let alone your personal time. Changing kitchen cabinets is extremely rewarding and painting existing cabinets is a great way to update a kitchen and change the look of your home. The existing cabinets are already sized to your kitchen and require only a few key steps to make them paintable. Many homeowners choose to hire professionals for this job, since painting can be difficult in a tight kitchen space, especially when cabinet doors need to be removed and specific materials and equipment are necessary for a quality job. However, having your existing cabinets painted by professionals is still a cost effective solution when compared to having new cabinets installed and fitted to your existing kitchen layout. Depending on the quality of cabinets you wish to install as a replacement, painting can be up to 80% cheaper than buying new cabinets. Ask your local painting company for a kitchen cabinet quote today and see what is possible! If you’d like to know more about our Orlando, FL kitchen cabinet painters in, feel free to contact us here or call us directly at 407.877.3210.